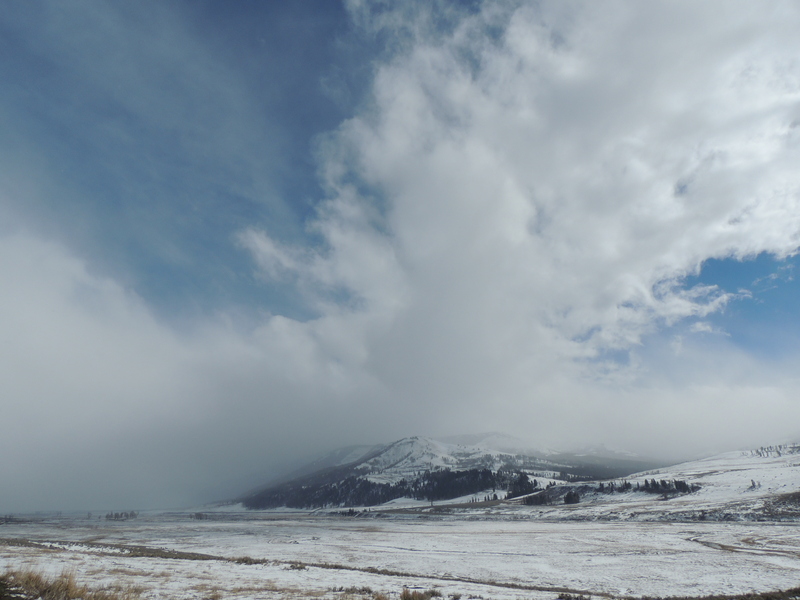 Blowing snow, blowing wind….freezing my tush off. Springtime in Yellowstone. 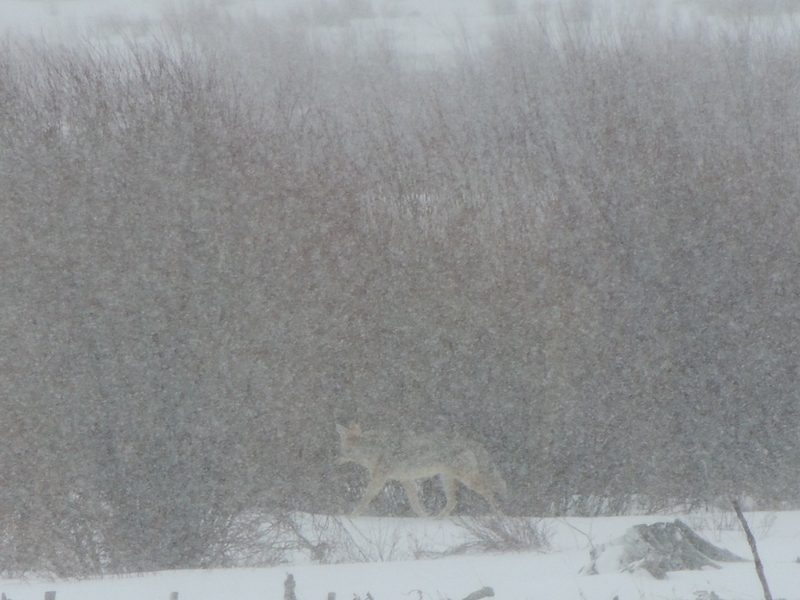 A ghostly coyote wanders through the blowing snow. I don’t imagine he’s too impressed with the weather, either. The trade off, of course, is an empty park. And gorgeous skies. 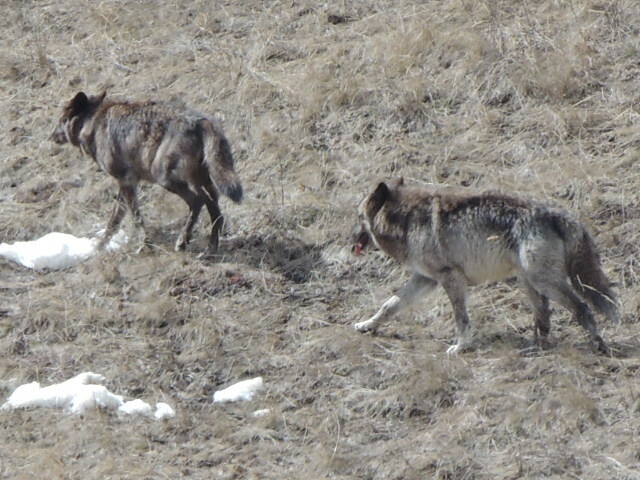 And being able to watch a couple of wolves without the accompanying crowds. Nonetheless, there are signs of spring. 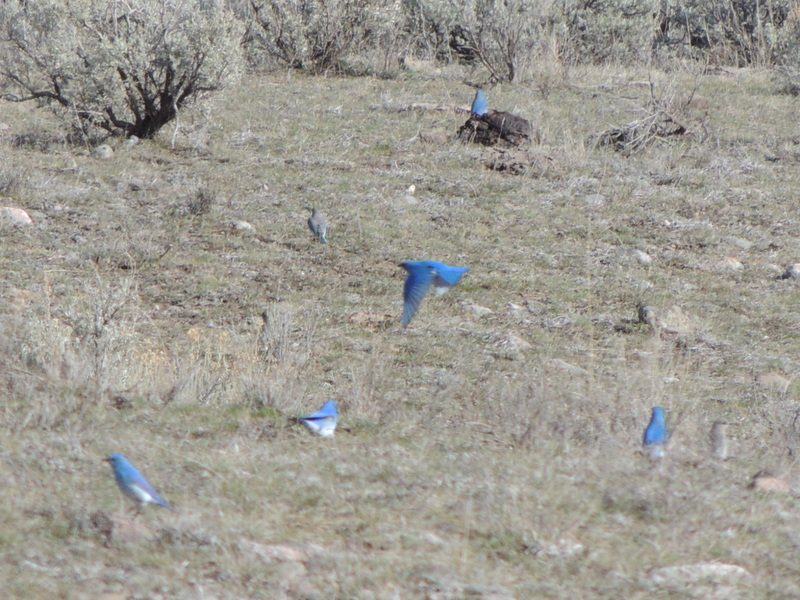 Flocks of Mountain Bluebirds flit from bush to bush, flashes of turquoise among the gray-green sagebrush. 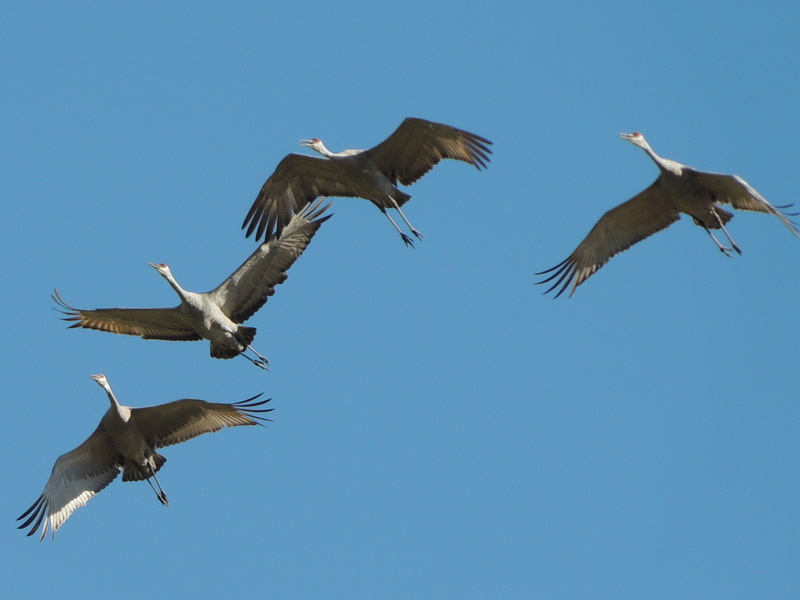 Sandhill Cranes rattle overhead, and one decides to land at the Blacktail Ponds. 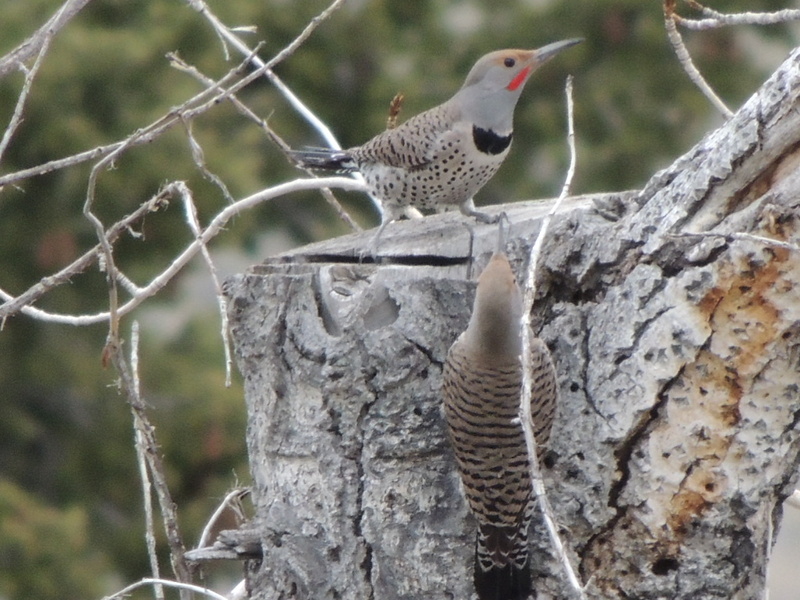 The Northern Flickers — who have been around all winter — have decided that it’s time to impress a mate. They are paired up, doing their silly little dance and flashing their bright orange tail feathers at each other. 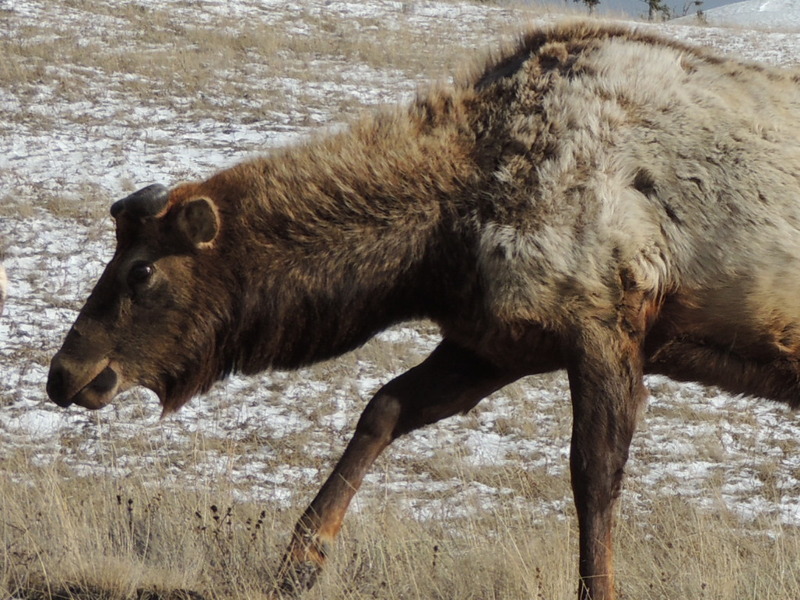 The elk did their mating in the fall, which is a good thing, because the males look pretty silly right now. He looks embarrassed, doesn’t he? 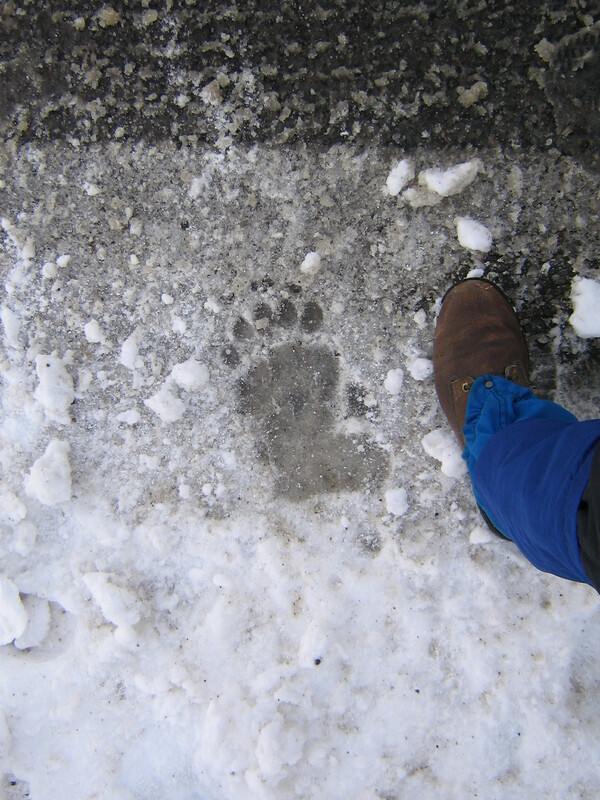 This entry was posted in Adventure, Hiking, Montana, Nature, Wildlife, Yellowstone and tagged Grizzly tracks, Spring in Yellowstone, Yellowstone wolves. Bookmark the permalink. 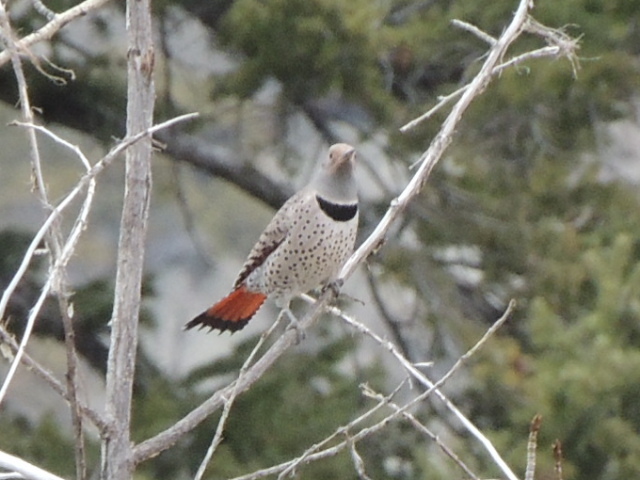 19 Responses to Spring in Yellowstone? How Can You Tell? It looks beautiful. 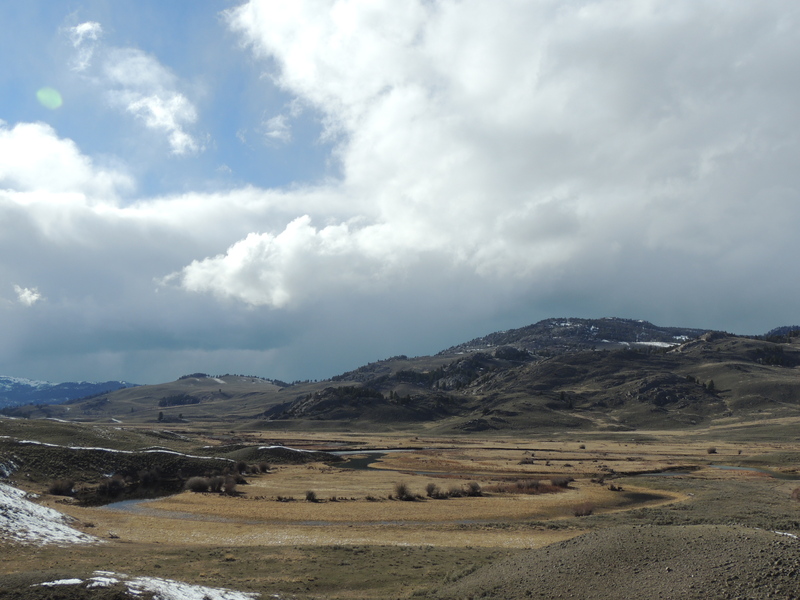 Yellowstone is my favourite NP and I’d love to see it in the wintertime, which is what your spring looks like! 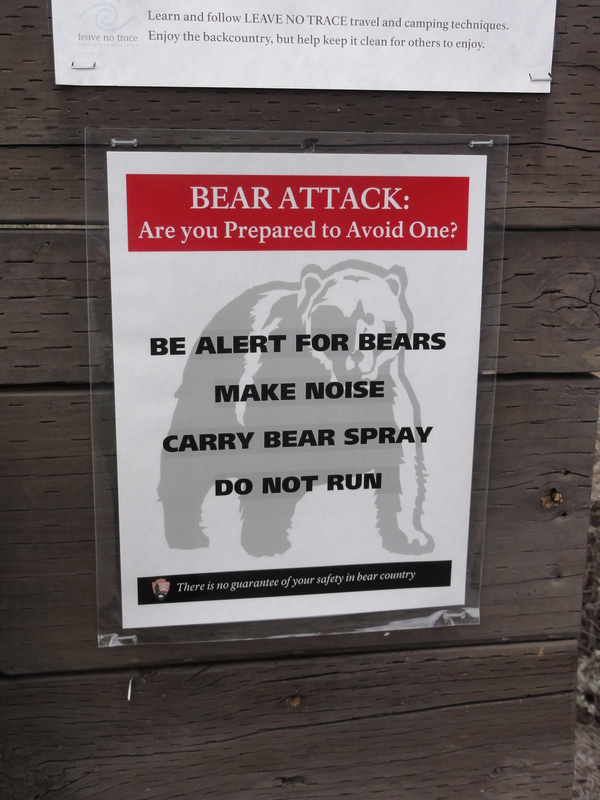 As for the bears – “Do No Run” – I really think I’d struggle with that one. I do believe I would struggle with that as well – I’ve never had to put it to the test. But maybe I’d just be frozen in fear? Thanks. Cindy! The first picture looks like the work of Montana artist Russell Chatham, whose work was recently introduced to me. Beautiful, and strangely impressionist. I love seeing your adventures! Hey there my friend! Thanks. Being compared to Russell Chatham is quite an honor! 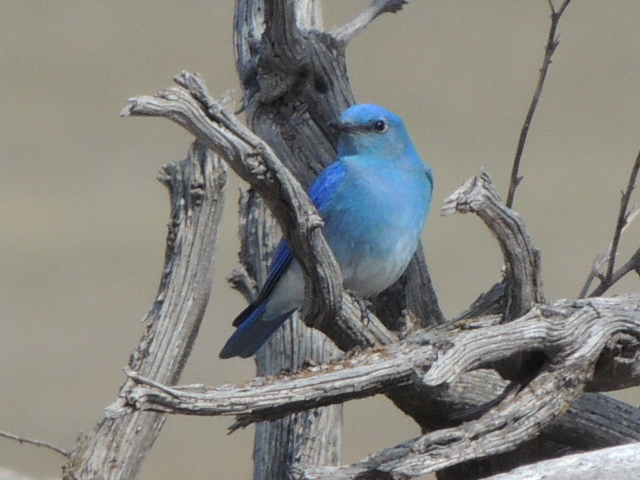 Great read and BEAUTIFUL pictures of the Mountain Bluebirds! Every time you “take” me to that park, it makes me want to be there. Glad you had a wonderful time with wolves to yourselves. Wow. Even when the weather doesn’t cooperate it’s fun to be there! As always, I enjoy seeing a part of the country I’ve never visited. 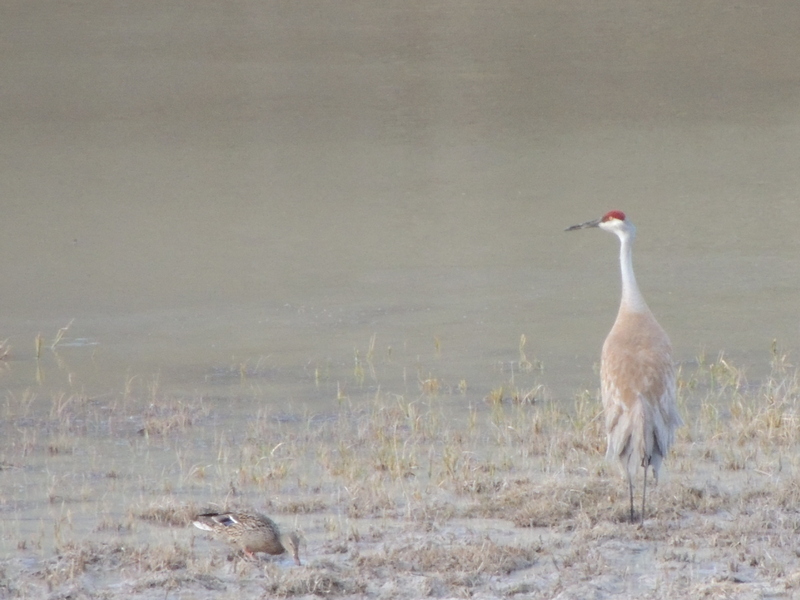 You are much braver than I ever would be in getting those wildlife shots. Oh, I certainly don’t feel brave! Thanks for taking the visit with me. Oh I loved the bear track. Pretty clear track, isn’t it? Kind of scary. Thanks so much. That track gave me a gasp, as well! Ha! Don’t let him near a grizzly, though! Thanks. The Huntaway would steer clear of the grizzly. The fox terriers, on the other hand, would probably have a go!